No. 209 Cabernet Sauvignon Barrel Reserve Gin is a popular Craft Gin available from Amazon.co.uk in 75cl to buy online. Visit Amazon.co.uk for the best price for 75cl of No. 209 Cabernet Sauvignon Barrel Reserve Gin or compare prices on our other Craft Gin products. The nose possesses toffee and caramel sweetness with hints of spice. The first sip is sweet and full with a hint of citrus, spice and subtle red wine notes. Mid-palate shows the only true remnants of gin with juniper, cardamom and rose-like coriander resting in the background. The finish is quite long, sweet and surprisingly spice-filled with cassia, clove, ginger and black pepper. At the very end there are chocolate and oak notes. Where to buy No. 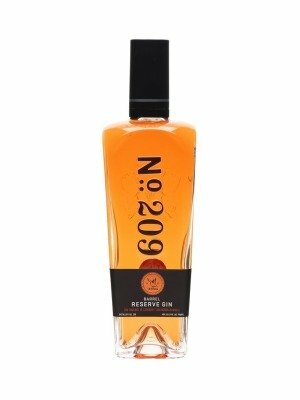 209 Cabernet Sauvignon Barrel Reserve Gin ? No. 209 Cabernet Sauvignon Barrel Reserve Gin Supermarkets & Stockists. You can buy No. 209 Cabernet Sauvignon Barrel Reserve Gin online in most retailers and find it in the Craft Gin aisle in supermarkets but we found the best deals online for No. 209 Cabernet Sauvignon Barrel Reserve Gin in Amazon.co.uk, DrinkSupermarket.com, and others. Compare the current price of No. 209 Cabernet Sauvignon Barrel Reserve Gin in 75cl size in the table of offers below. Simply click on the button to order No. 209 Cabernet Sauvignon Barrel Reserve Gin online now.